The OHAUS Digital Field Test Scale is designed for precision material testing in the construction industry. With a capacity of 165 lb and readability up to 0.05 lb, you won’t have to sacrifice precision for portability. Key features include the durable metal carrying case and internal battery with 70-hour life between recharges, making the Field Test Scale a powerful addition to any job site. 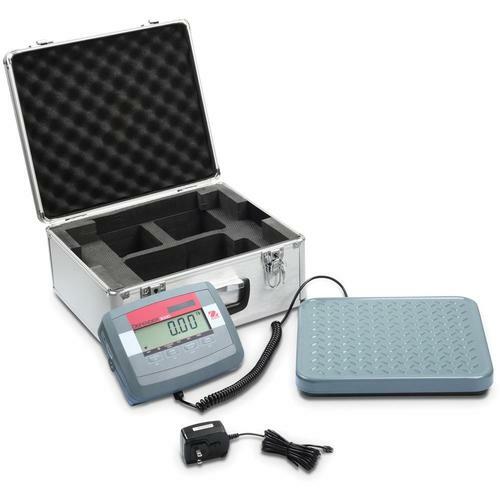 Designed for Precise In-the-Field Weighing A capacity of 165 lb with a readability of 0.05 lb and the painted steel base in a case means that the Digital Field Test Scale provides precise, clear measurements, no matter where you’re working. Packaged in a Durable Metal Case with Handle for Protection and Portability The Field Test Scale comes packaged in a durable metal carrying case with steel latches and carrying handle, ensuring maximum portability for use anywhere on the job—without limiting you to the lab. Equipped with a Range of User-Friendly Features The backlit LCD display allows for easy reading of results—even in low-light conditions. The internal battery means that you can operate for up to 70 hours between recharges. 15 × 7 × 13.5 in.